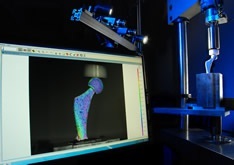 Lucideon’s 3DStrain testing service can offer you vital insights and understanding into performance, durability and failure analysis of your materials and products when interacting with external forces, weights, strains and stresses. The video clip below depicts a standard tensile specimen under tensile load-to-failure. Using Digital Image Correlation (DIC) technology our experts can perform testing and analyze the detailed data to provide you with clear, simple, quantitative results. Verify and refine finite element analysis models of complex geometries. 3DStrain can deliver non-destructive, full-field surface strain measurements on objects under load. We deliver movement tracking at the pixel level on most materials, for a range of sizes on complex geometries. With Lucideon you receive full analytical interpretation of the data from our experts, allowing you to make use of the vast, in depth feedback quickly and easily. 3DStrain also produces visual results that show how strains and cracks develop and grow, up to the point of failure. Lucideon’s 3DStrain service offers you detailed digital imagery showing the displacement on your product, correlated against a no-load condition. Non-Contacting and Non-Destructive: enables proof-testing of components without damage. Lucideon has a comprehensive quality assurance program, which is in compliance with 10CFR50 Appendix B, ISO 17025 and Nadcap (aerospace and defence industries). These rigorous QA requirements are applied to every job we perform as standard.